LogMeIn Rescue enables IT teams to support PCs, Macs,and mobile devices securely anywhere at any time over the Internet. In analyzing the experiences of Rescue customers, Nucleus found that a single remote support tool to support multiple types of devices, coupled with Rescue’s ease of use and management dashboards, enabled companies to increase support staff productivity, accelerate issue resolution, increase end user productivity, and increase customer satisfaction. In many cases, Nucleus found these benefits delivered payback in fewer than 6 months. 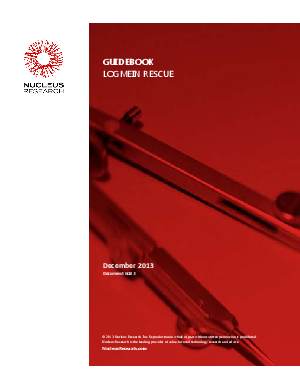 This guidebook analysis provides information on the the key benefits in using Rescue, its features and its functionality.